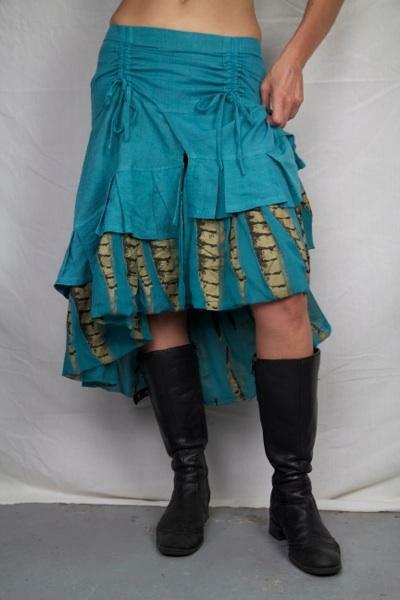 Beautiful double ruffle linen skirt with silk chiffon pheasant feather print under the ruffle. This is a fun and very wearable skirt. Made from linen, with the under ruffle made from silk chiffon that has been screen-printed with black/gold pheasant feathers. It’s a modest length so can be worn by all ages and body types. The ruffles give it great movement, and a playful feeling. This skirt looks great with boots, and also layered up with longer skirts or leggings. Available in Natural, Charcoal, Wine, Rust and Turquoise.